Travel up through a gorgeous valley to the summit of Table Mountain where you experience sweeping views of the Tetons. This truly unique, eye-level vantage places you excitingly close to these magnificent, granite peaks. The trail gets your heart pumping right away as it steeply climbs up into the valley for a short distance. Once in the valley, however, you can enjoy the scenery unfolding as the trail settles into a nice steady incline. The valley is a perfect mix of aspens, evergreen stands, and meadows with jagged rocks jutting out along the hillside. The surrounding mountains are an interesting, geological mix of bald domes, forested ridges, and rocky layers thick and thin. You follow North Fork Teton Creek up, crossing it a couple of times. This playful creek is a long collection of cascades and pools. As you go further up the valley, The Wigwams come into view. They are characterized by their gnarled cliffs and vast boulder fields below, evidence of the disintegration of the mountain. The trail turns south and begins to gain elevation in earnest as it switchbacks up. As you gain elevation through an alpine meadow that vibrantly blooms in mid summer, the button-topped summit of Table Mountain comes into view. The broad valley below is a geologic blender of various rocks, strata, and boulder fields. 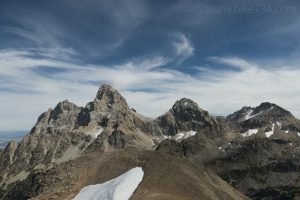 Further up, Grand Teton and Mount Owen begin to poke over the ridgeline in the distance. Once on the ridge of Table Mountain, scenic views in every direction are a feast for the eyes. Soon you reach the junction with the Face Trail. While the summit appears close, you still have 1.4mi/2.2km of climbing left. The views are expansive and serve as a great excuse to catch your breath as you work up this long, broad ridge. The footing can be surprisingly tricky in this area as you navigate several sections of shale. The incline increases just before you reach the cliff band that is the access to the summit. The non-technical routes to the top are easy to find as you pick your way through the rock. At the summit, you find that you have a front row seat to the Teton Range. Immediately across the South Fork Cascade Canyon is Grand Teton, flanked by Mount Owen to the north and Middle Teton to the south. Pull out a snack and a map as you figure out all of the endless craggy summits and deep canyons stretching in all directions. Bring a jacket, hat, and gloves as it can get cold on a windy day. Turn around here and head back down through the valley. An alternative, and more direct route up (or down) is via the Face Trail. This route is frequently used as the uphill route due to it being 2.7mi/4.3km shorter than the trip through the valley. However, it is extremely steep with poor footing and limited views compared to the longer route through the valley. Regardless of the way up, it is not recommended to take the Face Trail for your route down. 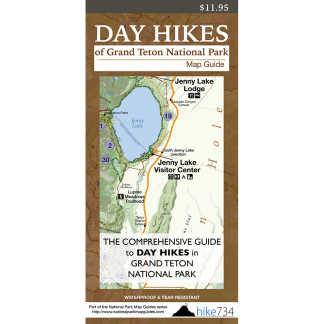 Also note that this entire hike is through Jedediah Smith Wilderness, and the actual summit straddles the wilderness area and Grand Teton National Park. Contact the Caribou-Targhee National Forest for information and regulations regarding travel through this designated Wilderness Area. Trailhead: From the town of Driggs, Idaho, take East Little Avenue heading east (which becomes Ski Hill Road) for approximately 6.6mi/10.6km to Teton Canyon Road. Drive the gravel road to the parking lot immediately past Teton Canyon Campground. The trailhead for the Face Trail is down the road from the Teton Campground and across the bridge at the end of the road.